Love the handles on this big. They are one of a kind. Eco-friendly too. Just received my order and couldn't be any happier! The bags came out just as I'd hope they would. Thank you Custom Earth Promos for the great service. Very durable bag! Ordered 500 of these bags for my upcoming event and can't wait to display them. Great material on this bag. Well worth the investment. I'll be sure to shop more using CEP in the future. Loved these bags! It was a perfect way to promote my company! I have re-ordered JB13 4 times now very popular bag! Our Logo is displayed in such detail on this bag thank you CEP. Just in time for our big grand opening. I ordered just over 2 weeks ago and did a rush order with a simple print on our bag and I am extremely happy with this company custom earth promos right now. 7 stars from me!! Cute size, I like the designs they have on the website. I just received my order and they came out great! I wish I can take credit for ordering this bag I can not, my colleague did and it was a great idea, it represented our company well and every single person who received one at our trade show talked about the bag. For our use which was for a golf tournament it made the perfect handout for participation. We raised alot of money and I was very happy with the bag that we handed out to all participants. I use this at my pharmacy to sell as a reusable bag. It is a overall nice bag, as a mom and pop pharmacy I needed to do some type of advertising and marketing to promote my business. This bag has done that and some for me. Perfect size for a gift bag. Definitely a good bag I checked it and tested it when we received our order I suggest this Jute bag. I absolutely recommend custom earth promos. Perfect size gift bag. I use this bag every year for the holidays to give to our employees and customers. Exceptional customer service. I love using custom earth for everything eco-friendly and promotional. This is my packaging bag that I give to all the ladies at my salon who purchase shampoo, hairspray, etc. any hair products from my salon. They all love it and the print of my salons logo on the bag looks great. I suggest this to any women's store this bag just has that look I feel. They always work with me on pricing and ship dates. Its always a challenge for me and for my company to find a eco-friendly solution to promote our company that is within budget and will arrive on time. Custom earth has solved this problem for us numerous times I recommend them. Chic looking, the jute is a great material. I will order this again I loved it. These folks are professional and helped me the whole way. Our Small Wholesale Reusable Jute Bags are a fantastic choice when seeking the greatest possible exposure for your brand and its message! Coming in a variety of vividly illustrative colors, you will effortlessly convey your brand’s vivacity and message while not sacrificing quality nor a positive statement about the environment, which is becoming increasingly important in today’s eco-conscious world. 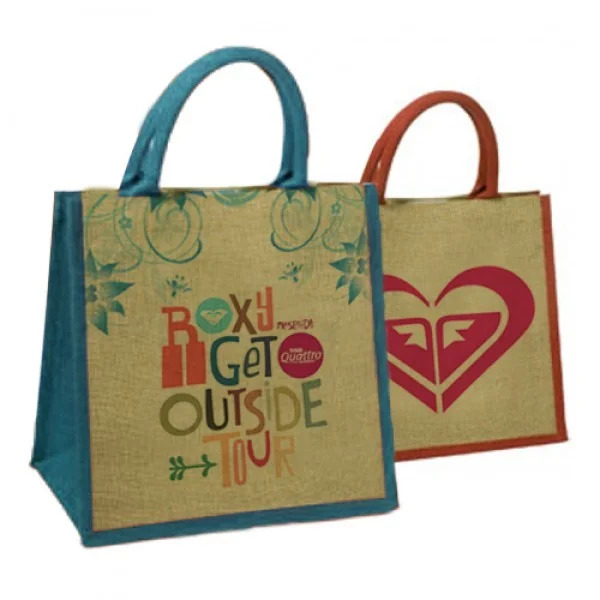 Our popular Small Reusable Jute Bags are a stylish way to garner recognition for your brand. The available color schemes frame the imprint area on the naturally-colored sides and serve to conspicuously highlight the design of your choice. Clients and potential clients alike will initially be drawn to the stunning colors bordering the bag and focus subsequently on the central area where the valuable message you wish to convey is located. Clients will also be impressed by the material used in the bags’ manufacture and the longevity by which they will be able to use the bags. These bags are a great investment in that they are suited for long-term use and will express your brand’s statement for years and decades to come. Our collection of Small Wholesale Reusable Jute Bags is perfect for any occasion, whether used as a gift bag at a party, a carrying bag at the grocery store, or a shopping bag. These bags consist of jute, a naturally strong and durable fiber, and are complemented by a laminated backing which supports the durability of the bag as well as protects it from moisture and the elements. Your clients will not need to worry about any tearing issues they might experience with other, more conventional bags! Although smaller than most of our other jute products (at 11 7.88” W x 12” H x 7.75” D), it compensates for its size by having a relatively large 7.75” gusset, which allows for the inclusion of more and bulkier items within its carrying space. One of the Eco-Friendly Small Reusable Jute Bag’s defining features is its visually appealing style that will be sure to catch your potential clients’ eyes. The naturally-colored sides of the bag are harmoniously complemented with your choice of five distinct colors (Black, Brown, Blue, Red, and Lime Green) which adorn the piping, gusset, and rope handles. Moreover, the beautiful coloration of the jute bag aptly serves to illuminate the design of your choice which fits within a generous 7.5” W x 7.5” H imprint area. The functionality of the Small Wholesale Reusable Jute Bags is likewise excellent. Equipped with 14” handles and Velcro closure which seals contents within the bag, comfort and security are always non-issues. Your clients will be amazed by the superior versatility this remarkable bag affords! Our custom production facility crafts all orders according to your explicit design specifications and to top-quality standards set internally at the facility. It is accustomed to receiving and producing bulk custom orders and completing them within the given required time. The imprint method for this product is silk screen with one color only.